My name is Kelly Duckworth, the latest person to join the Best Foot Forward (BFF) team. I was recently trained on how to track and measure how many people stop for walkers in marked crosswalks. My experience is below. Imagine this: you’re crossing the street in a marked crosswalk. You look to the right and lock eyes with the driver, who is gunning the gas. All you can do is stop dead in your tracks. The car swerves, honks, and the person screams out the window, “Get out of the way.” It’s all too familiar – an ear-piercing horn and a gust of wind. What I learned through my data collection training is that Metro Orlando is the most dangerous place for walkers (and runners!). I knew it was bad, but not THAT bad. This is unacceptable. That’s why the grassroots initiative, Best Foot Forward, focuses on one thing – getting people who drive to yield to walkers in marked crosswalks. Sounds simple. But, simple does not mean easy. The good news is that BFF uses the “Triple E” approach, combining engineering, education and enforcement. The better news is that there is a methodology to track progress, from the Institute for Traffic Engineers. And on a warm and misty day, I experienced how BFF measures progress with the help of Tony, one of BFF’s superstar data collectors. Tony is a retired Orange County Crossing Guard and BFF’s “chief trainer.” It’s all about the “Four-Step Process”…. Assess your surroundings: location, speed limit, weather, time of day, crosswalk (signal or unsignalized), signage, proximity to bus stops and schools, traffic volume, construction, number of people walking or biking, the list goes on. Mark the dilemma zone: the distance you give cars before you begin crossing the street. For 35 mph streets, you give cars almost 200 feet to stop. For 40 mph streets, you’re looking at almost 250 feet – that’s the length of five and a half school buses. ATTEMPT to walk: Put your foot in the marked crosswalk. TRY to make eye contact with the driver. Cross the street at the designated crosswalk – 20 times, three different times of day, which takes about an hour. Record. Record. : How many cars did or did not yield? Did you get stuck in the middle of the road? There is a whole data matrix! Though Florida drivers are required by law to yield to people walking in a crosswalk, signalized or not, this is a lot easier said than done. Something I have quickly learned since joining the BFF team. 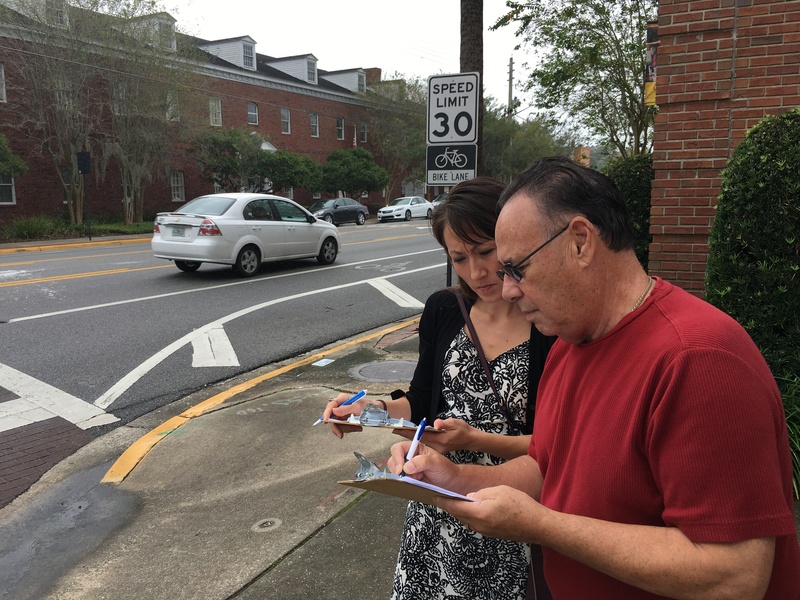 Together, Tony and I measured driver yield rates at Edgewater Drive and Shady Lane, which does not have a signal, and Orange Blossom Trail and Colonial Drive, which does have a signal. Some drivers yielded, but, unfortunately, many did not. A total of 24 drivers did not yield (two honked and many sped by as if we did not exist). However, on the bright side, 14 people did exercise caution and yielded properly. This gives me hope! My overall experience is summed up in four words – alarming and eye-opening. I actually found myself getting upset when people flew by. I was reminded that courtesy and responsibility make a difference. And, BFF has the methodology to prove it.